Will 2012 be remembered as the unofficial Year of Cassava? It might be an abuse of artistic license, but 2012 might well be remembered as the first International Year of Cassava – in all but name. That’s because this year has already witnessed a sea change in the way the world regards this long-neglected crop. And it’s about time really: cassava feeds half-a-billion people in Africa every day, and is also grown by millions of smallholder farmers in Southeast Asia and Latin America. That’s while many in the developed world probably aren’t even sure how to spell cassava. But there is little doubt that the crop’s fortunes now appear to be on the rise. 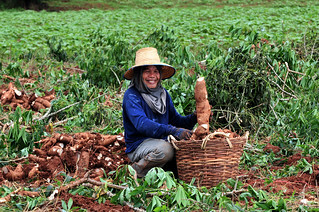 A major event in the 2012 cassava calendar came in February, when CIAT research revealed that cassava could be one of the most climate-resilient crops for smallholder farmers in sub-Saharan Africa. Climate prediction models showed likely gains in cassava suitability in many parts of the region as temperatures rise, while the suitability of most other staples either stagnates or declines. Cassava’s ability to tolerate drought and poor soils makes it a survivor, and means it could become one of the most promising fail-safe crops for African smallholders. To be elevated to the position of “Rambo root” was something of a coup for a humble crop that consistently seems to have been edged out of the spotlight by better known staples like wheat, maize and rice – a Bermuda Triangle of food crops, which for better or worse, sometimes seems to make others drop off the development radar. As a fitting counterpoint to the Rambo root research, a second CIAT study, published last month, once again brought into sharp focus one of the greatest hurdles to maximizing cassava’s potential as a supposedly “climate-proof” crop: its vulnerability to pests and diseases. The list of threats is long and varied: cassava brown streak disease, cassava mosaic disease, whitefly, mealybug and green mite, to name just a few of its formidable enemies. The study found that pest and disease pressure could become even more severe as the effects of climate change take hold. The report raised the alarm – hopefully in good time – for scientists around the world to build on existing work to strengthen and develop new ways to protect against cassava’s so-called Achilles’ heel, and ensure that this Rambo root doesn’t face a, well, rocky ride. This latest research builds on CIAT work published in the second half of 2011, which identified several hotspots for new pest and disease outbreaks in cassava fields across the tropics. With all other conditions being right, it would take little more than a few infected plant cuttings smuggled across an international border to trigger a “perfect storm” of outbreaks in what were previously considered safe havens. Here, the absence of natural predators could provide invasive pests with a whole lot more than just a free lunch. 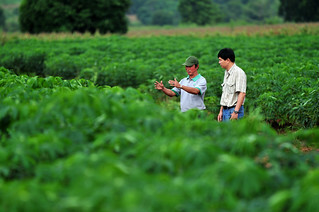 The speed with which pests can strike and cripple cassava production was witnessed in Thailand in 2009-2010, when the small-but-feared cassava mealybug – resembling something akin to a woodlouse dipped in talcum powder – made the second transcontinental leap in its history, from its native South America, to Southeast Asia, presumably via Africa. It inflicted enormous damage on Thai cassava fields, threatening the livelihoods of many small producers. In what appears to have been a successful game of international cat-and-mouse, scientists from the International Institute for Tropical Agriculture (IITA), the Thai Tapioca Development Institute (TTDI) and Thai Department of Agriculture reared and released a “SWAT team” of South American parasitic wasps to hunt down and exterminate the mealybugs in a carefully coordinated “sting” operation. Only due to decades of cassava research was such an intervention possible. There are, of course, other possibilities for tackling cassava’s pest and disease vulnerability, including the breeding of resistant cassava varieties, and improving crop management. Last week, it was announced that the Bill and Melinda Gates Foundation had awarded CIAT a grant undertake research into the possibility of developing “synthetic” cassava seed, as part of the Foundation’s Grand Challenges Explorations initiative, established to fund innovative global health and development research. By growing plants from clean, synthetic seed, cassava production could be transformed, possibly enabling farmers to switch away from planting stem cuttings, which often allows pests and diseases to pass unchecked from one growing season to the next. Numerous other organisations have seen increasing interest in cassava research in recent years, some with major donor support – like the CGIAR’s own Roots, Tubers and Bananas Research Program, officially implemented in January. Now, as we approach the mid-way point in 2012, there’s another opportunity to further ratify the importance of cassava, strengthen research and build on the growing momentum. As announced on the CIAT blog today, the second meeting of the Global Cassava Partnership for the 21st Century (GCP21), in Uganda, in June, will bring together some of the world’s leading cassava scientists and donors with the aim of maximising the crop’s potential in face of climate change. By working to identifying the gaps and most urgent priorities in research, the conference could help catapult cassava into the mainstream of crop science and help it rise, quite literally, to the table. This in turn could provide the foundations for an official, International Year of Cassava in the not-too-distant future.